The sights and sounds of water running over natural stone tend to calm the soul and promote tranquility. However, not all water features are created equal. A photo only conveys a limited amount of information. What makes an Adagio Serene Waters product different? Here are a few qualities that make Adagio the leader in water features: • QUALITY - built by Adagio Water Features, the leader in manufacturing of water features since 2001. Almost every material used in this model is sourced in America and completely manufactured and assembled by skilled artisans in Utah. • AESTHETICS - the look and feel is pleasing to the eye and will compliment any room décor. The powder coating and metal finishing are completed to perfection. • FUNCTION - extremely light weight and installation takes only minutes. • RELIABILITY - the welded plastic liner insures against leaking and the unique water distribution system will not clog thus preventing uneven water flow. • HALOGEN LIGHTING - the lighting system illuminates the natural beauty of each water surface, as the water cascades down to the polished river stones. Light bulb included. • UTILITY - runs off an 110V outlet and consumes little energy. Only 1 cord is needed to operate the lights and pump; therefore, the cord can easily be concealed by placing the outlet directly behind the water feature. • WELLNESS - increases the negative ions in your home or office thereby boosting energy and enhancing your mood. It also acts as a humidifier and air filter thus helping to improve air quality. • WARRANTY - backed by a one year limited Manufacturer's Warranty. The sleek design and versatility of the Serene Waters makes it a very popular choice. 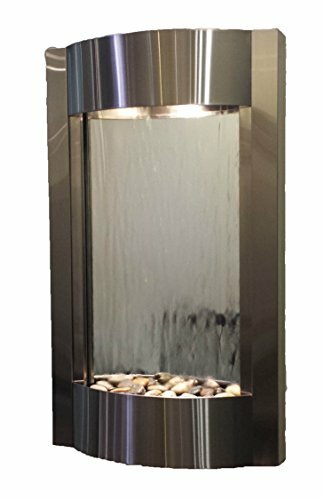 Buy it today and discover the beauty and tranquility of owning an Adagio Water Feature! *THIS LIGHT-WEIGHT SLATE VENEER KNOWN AS FEATHERSTONE IS NATURAL STONE AND THEREFORE MAY DIFFER IN COLOR AND TEXTURE FROM THE PHOTOS SHOWN. View More In Wall-Hanging Fountains. If you have any questions about this product by Adagio Water Features, contact us by completing and submitting the form below. If you are looking for a specif part number, please include it with your message.